Okay let's take a moment for real talk. Cape Town, South Africa, practically the edge of the world. It can be somewhat hard to get to and hasn't been around for that long compared to other places like Europe or Asia. And when we first started to research it, we thought it HAD to be overhyped. But to be honest, it actually lived up to and surpassed our expectations. One of Africa's most popular cities, nestled in between gorgeous beaches and the stunning table mountains, Cape town has a lot to offer. But what's most memorial is the unique culture that fills the town with the bustling weekend markets, art galleries on almost ever corner, beautiful gardens, and of course the FOOD! Clifton's Beaches: When you want the ideal beach experience including waves and an expansive sand bank, head to Clifton's beaches. There's a couple different Clifton beaches but we ended up going to Clifton's 2nd. It's more of a laid back beach where you can bring a picnic and spend the day. You'll find many people bring their ukuleles and guitars to jam out to music while taking in the rays. Kaulk Bay: A fun little hippie town filled with one-of-a-kind clothing and antique shops. There's a lot of really good restaurants and juice bars. Sundays can be a little sleepy but there is a market in their community center including a food hall and shops selling local jewelry. It's a bit farther out from Cape Town but is easily combined with other day trips like the Cape of Good Hope or Boulder's beach to see the penguins. Noordhoek: In between Hout Bay and Kaulk Bay Noordhoek is a real "local's only" type of beach. It's farther removed than other Cape town beaches and so most tourists typically don't venture down to it. We happened upon it by chance and thought it was absolutely beautiful. There's a quick five minute board walk down and then white sands as far as the eye can see. Be sure to check the weather before though, if it's a breezy day Noordhoek can see some strong winds! Waterfront: A town by the bay with white sail boats and classy shops. This is the chic part of Cape town where you go to see and be seen! If you've ever wanted to see penguins, but rather not endure the frozen tundras of Antarctica, here's your chance! Head down to Boulder's Beach (about 1 hr south of Cape Town) to hang with over 1,000 penguins that call the beach home (smart penguins right?). There's a slight fee to get down to the beach but once your there, there's no limits to how long you want to stay - take a picnic, spread out a towel and spend the morning or afternoon. This is really the best way to see the penguins because you can wander right up next to them and get amazing pictures. We'd suggest trying to go around low tide so you can wander around the rocks and boulders to find little pockets of penguin families all to yourself! Weekend markets is another thing Cape town has no shortage of. If your there on a Saturday or Sunday be sure to check out at least one. Our favorite (and Cape Town's largest) is the Old Biscuit Mill's Market located in Woodstock. They have jewelry and clothing pop up stands as well as over 100+ food stalls serving up delicious breakfast and lunch foods. Go hungry and with some time to explore a bit of the shopping. Another worthwhile market is the Bay Harbor market, its slightly smaller than the Old Biscuit Mill, but has a similar spread of food stalls and unique shopping. We are both suckers for some good street art! It's a unique way to get in touch with the local artists who choose to use buildings as their backdrop instead of a traditional canvas. Woodstock also has funky stores and great local eats, so it is worth a visit and stroll! If you want to learn even more about the graffiti history and what they all mean, take a street art tour and get the low down. We did this and really enjoyed getting to know the painters and backstory behind the art. Being down in South Africa you are right along the bottom cost of Africa. Go down to the southern most tip of the Cape Town Peninsula to see the Cape of Good Hope. Driving down is half the fun as the Cape Town peninsula has some great coast lines and beaches to stop at along the way. There's a charming little lighthouse to visit and trails if it's not too windy when you reach the cape. You can hike up to the lighthouse (or take a tram up) but it's worth seeing to take in the panoramic views of the southern tip. Cape Town has one of the most diverse botanical garden's in the world. It's like the red carpet for plants. You'll have some serious #plantgoals walking through the park that's filled with everything from rare species, to fields and fields of flowers. There is nothing like getting away from the city for a few hours and walking through nature. Plan to spend a few hours (or an entire afternoon like us) because there is just so much to see. They even do some concerts in the evenings if your lucky - check online because what's better than rocking out with the plants? There's a section of Cape Town with amazing painted houses of all different colors. It's a magical little neighborhood that reminds me of a kid's color book, and is something you DON'T want to miss. Take your camera and admire each with it's own individual flare. There's a lot of new restaurants popping up, all offering local ingredients, craft and artisanal takes on classic dishes, and innovative new ideas. The main buzz is around healthy and locally grown organic produce that is being incorporated into almost all the menus. "Banting" is also a big thing down there which is the Cape Town version of the Keto diet, which means things like cauliflower pizza and lettuce wrapped burgers are common at most places (which is great if your looking for a healthier option- or not)! 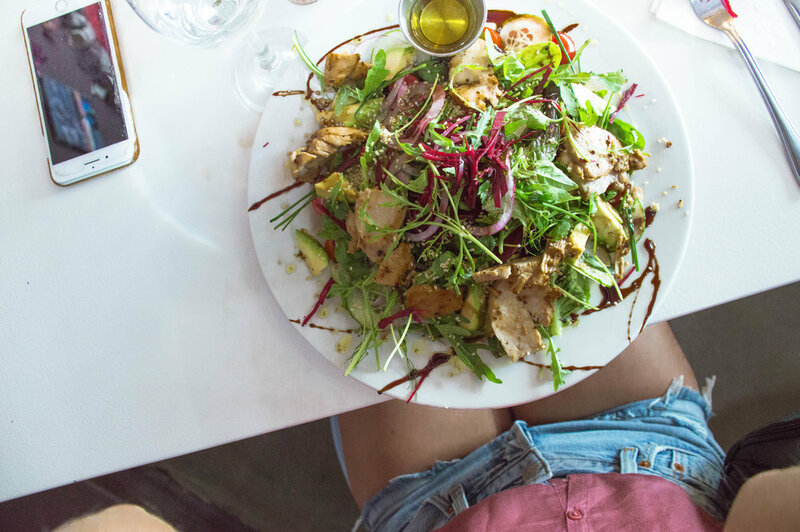 Some of the favorite places we tried included salads from RCAFE, acai bowls from NU HEALTH, Grassfed steaks and local exotic meats from THE VILLAGE, and cauliflower pizza from COL'CHINOS. Cape Town has a powerful history from the time it was under Dutch rule to the freedom that came later. There's been a lot of tragedy and fighting that led to where it is today. Make sure to check out the museum and ask for one of the guides to take you through and explain. If you have time you can also visit Robben's Island to learn more. There's nothing like getting a bird's eye view of a city. Our favorite thing to do when we first arrive anywhere is try and find someplace high to get a feel for the whole place. You can either hike up to the top, ride the gondolas, or split it by hiking one way and riding the other. Plan to try and do this on your first day because if the wind is too strong they will shut down the cable cars, so you'll want flexibility of a few days if possible.. There's also a lot of hikes to choose from around the table mountains ranging from a few hours to all day hikes. If your going to do one we'd recommend you consider a sunrise or sunset hike, so it's not quite so hot and you can really take in the view. Lion's head is a favorite for sunrise hikes and you can choose to start at the base or about half way up for a shorter experience. just remember to pack lots of water because Cape Town sun is no joke.